You often hear Alzheimer's caregivers say that family members or friends don't believe that their loved one is suffering from Alzheimer's disease. Should this come as a surprise? Alzheimer's disease is hard to detect. Most personal care physicians can't do it because the typical doctor appointment lasts about ten minutes. Talk to most Alzheimer's caregivers and they will tell you their loved one can fake it while at the doctor. This is especially true at the beginning when their communication skills are still intact. Have you seen this? I think I might have unintentionally led some people here to believe that my mother is "aware" that she suffers from Alzheimer's disease. This not the case now, and it has never been the case. She has no awareness of her Alzheimer's. 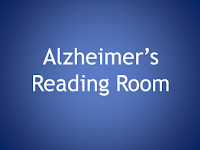 It does intrigue me when Jay Smith, Phil, Mike, and others openly discuss how they feel, and how Alzheimer's disease impacts them in their daily living. Have you ever heard Richard Taylor speak? They tell me he is riveting. He has Alzheimer's disease. It seems to me that the majority of Alzheimer's patients are either unaware or deny that they suffer from Alzheimer's disease. Does you Alzheimer's patient openly tell people that they suffer from Alzheimer's disease? With most diseases the patient can tell you they are sick. And, how they feel. My Alzheimer's patient, Dotty, can be very sick and when the doctor asks she will say -- I'm fine, their is nothing wrong with me. This has been the case for the entire seven plus years that I have been taking care of her. She has pneumonia right now and if you call her on the phone she will most likely tell you -- I'm fine. I am referring to when someone calls and talks to your Alzheimer's patient on the telephone. Frustrating and disconcerting, right? There is a way to dismiss the problem of people being unable to accept that a person suffers from Alzheimer's disease; and, to get definitive evidence that a person is suffering from Alzheimer's disease. This is accomplished by going through a series of tests that rule out treatable diseases that present with dementia like symptoms; and then, ruling in the "type" of dementia. In other words, getting a conclusive diagnosis of probable Alzheimer's disease. Once the diagnosis is "official", you then ask the doctor for a written letter stating clearly that the person is suffering from probable Alzheimer's disease or dementia. You could then mail copies to family and friends if you think or believe it is necessary. It took many years for most of our family and friends to come to the understanding that my mother was suffering from Alzheimer's disease. Did they believe? Not at first. I think when they first started to hear her wild and crazy stories they start to come around. Let's face it, most of the time they come "into reality" after they spend some "extended" time with the patient. I don't mean hours, I mean 24 hours dayS. You then get to see the shock on their face. You will also hear these famous words -- "I don't know how you do it". One of our closest friends finally "understood" when my mother told her that she was driving herself to the grocery store and mall everyday. Our friend looked on in shock -- disbelief actually -- as my mother described her daily activity. Our friend knew that Dotty had not driven in four years and would have been unable to navigate a mall on her own two feet. She finally "understood". Which brings us to the issue of a definitive test for Alzheimer's disease. Did you get all the tests that are necessary to make a "definitive" diagnosis? If so, get a written diagnosis. Get it on paper. You will need it sooner or later. In the article -- I'm 46 Years Old, I Can't Have Alzheimer's Disease -- Jimmy Smith describes his own definitive diagnosis. If you are at wits end, if you are driving yourself crazy, if it bothers you that others don't or won't believe that the person is suffering from Alzheimer's -- get the written proof. Will they then believe you -- you can answer this one. I can promise you this, the majority of Alzheimer's disease caregivers that find themselves with disbelieving family members or friends will find great comfort and emotional relief in knowing that they presented the definitive evidence of an Alzheimer's disease diagnosis. Alzheimer's disease is hard to spot, hard to diagnosis correctly, and hard to believe. In other words, BunkHouse logic over ButtHouse logic.